celebrated gun-running by British ships during the Civil War; and one from 1899 based on Jules Verne's novel, Le Testament d'un eccentrique, in which the players travel across America to win a legacy from a Chicago millionaire. 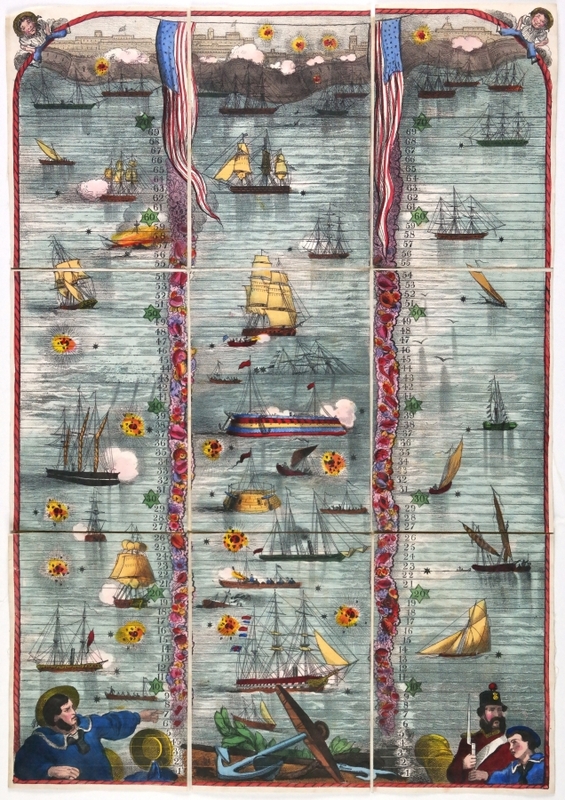 In conjunction with the exhibit, the Grolier Club is hosting an international colloquium, "Some Beautiful Board Games," on April 5 from 1 to 5 followed by a reception. The program: Irving Finkel (British Museum, London) The Royal Game of Ur; Anne Dunn-Vaturi (Metropolital Museum of Art, NYC) Hounds and Jackals; Alex De Voogt (American Museum of Natural History) Mancala; Adrian Seville (Curator of the Grolier exhibition) Two Fine Goose boards; Andrea Immel (Cotsen Library, University of Princeton) The Game of the Dolphin; Margaret K. Hofer (New York Historical Society) Bulls and Bears: the Great Wall St. Game. « A picture is worth . . .